Voldyne Incentive Spirometer from HealthyKin.com is used to help improve the function of your lungs. It measures how deeply you can inhale. The Voldyne Incentive Spirometer helps you take slow, deep breaths to expand and fill your lungs with air. This helps prevent lung problems, such as pneumonia. 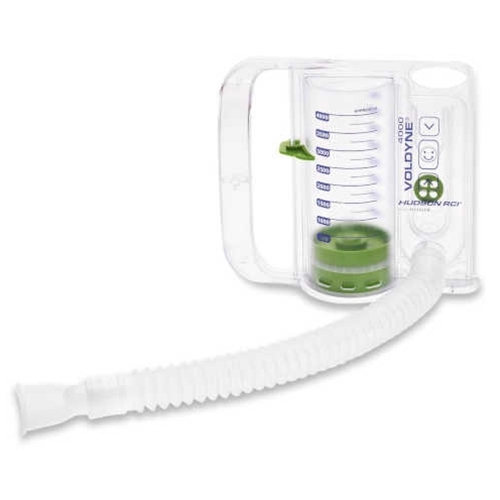 Using your incentive spirometer after surgery will help you keep your lungs clear and will help keep your lungs active throughout the recovery process, as if you were performing your daily activities. It works at first I did not under stand it or believe in it. But after using many times I feel and can see the difference. Oh by the way I have very very bad cop been in the hospital 23 times ! Excellent relief of congestion during and after hospital stay. Use it every day to increase circulation & oxygen access. Bought four more units for my family. Really improves lung capacity after bypass surgery. Just like the hospital gave to my husband after a stay. Great. the spirometer is good and i was glad for the little chart showing age ranges. the company sent it extremely fast. very satisfied. Great use! I love using it for my music class. as i work in a college bookstore, i have not used it but can say from a student's perspective, it is useful and inexpensive to use during my program. I am hoping it will help my breathing Too early to tell.